There's something special about knowing that you took care of your Subaru with the utmost care and the best parts. Right now at Carter Subaru Ballard, we're making it easier to get the genuine and factory-approved parts you need with this buy more - save more coupon. With this coupon, when your parts order totals between $100 and $199, you'll save $10. Purchase between $200 and $299 worth of Subaru parts, and you'll save $20. To get even more from this limited time coupon, get between $300 and $499 worth of parts, and you'll save $40. For even better value for your money, we're taking $75 off parts orders totaling $500 or more. This is a great time to stock up on future oil changes while getting the parts you need to get the most from your Subaru, but don't wait. This buy more - save more parts coupon will expire soon at Carter Subaru Ballard. It's no secret that trusting genuine OEM parts and factory-approved accessories is the best way to get the most from your Subaru, but did you know that these parts and accessories can be more affordable in the long run? In our parts department at Carter Subaru Ballard, you'll find a comprehensive inventory of genuine Subaru parts, products, and filters to ensure quality maintenance and repair. Our frequently updated special offers are great for saving even more on our competitive pricing, and you can find out more of what to expect in our genuine Subaru parts information pages. 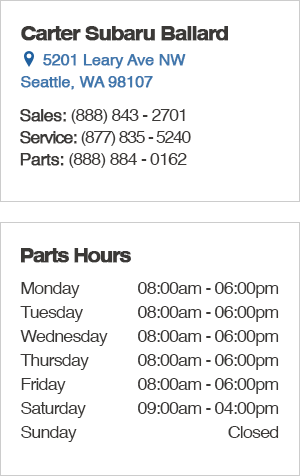 Browse our online parts store and conveniently place your order while there, or stop by and see us in person at 5201 Leary Ave. NW, Seattle, WA 98107. At Carter Subaru Ballard, we're proud to serve Kirkland and Redmond, and we look forward to serving you.